Dr. Lauren Lindstrom was appointed Dean of the School of Education in June 2017. 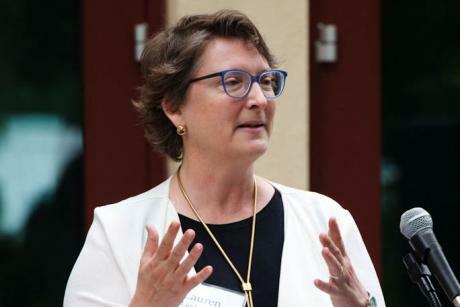 She brings to the School more than 25 years as an academic and administrator at the University of Oregon’s College of Education, most recently as Associate Dean. Dean Lindstrom is an active researcher whose areas of interest include autism and developmental disabilities, special education, career and college readiness and transition services for youth with disabilities, and access to quality education for families in poverty. She has been recognized internationally for her work promoting employment and access for individuals with disabilities. She is an affiliated faculty member at the UC Davis MIND Institute and a member of the UC Davis Graduate Group in Education. Fulbright Specialist (2018 – 2020). Selected by the Peer Review Panel of the U.S. Department of State, Bureau of Educational and Cultural Affairs to be included on the Fulbright Specialist roster. This program pairs highly qualified U.S. academics and professionals with host institutions abroad to share their expertise and strengthen institutional linkages while building capacity at their overseas host institutions. Executive Leadership Academy Fellow (2018). One of 49 leaders in higher education selected to attend the Executive Leadership Academy: “Leading in a Multicultural & Global Environment”. Sponsored by the University of California Berkeley Goldman School of Public Policy, Center for Studies in Higher Education. Zero Project “Innovative Practice” International Recognition for Vocational Education and Work Programs (2017). Awarded by the Essl Foundation and World Future Council for the Paths 2 the Future model for high school girls with disabilities (Lauren Lindstrom, Principal Investigator) in recognition of an innovative practice supporting the United Nations Convention on the Rights of People with Disabilities. One of 56 programs worldwide designated as an “Innovative Practice” in 2017. Presented at the United Nations International Center, Vienna, Austria. “Employment for All” Award (2013). Awarded by the European Association of Service Providers for Persons with Disabilities to the Youth Transition Program (Lauren Lindstrom, Project Director). One of 10 programs worldwide designated by an international panel of experts as a best practice that promotes employment and access for individuals with disabilities. “Innovative Practice” International Recognition for Employment (2013). Awarded by the Essl Foundation and World Future Council to the Youth Transition Program (Lauren Lindstrom, Project Director). One of 40 programs worldwide designated as an “Innovative Practice” designed to increase access and promote employment for individuals with disabilities. Distinguished Research and Outreach Award. College of Education, University of Oregon (2011). Awarded to the Youth Transition Program Technical Assistance Team (Lauren Lindstrom, Project Director). This award recognizes excellence and impact in outreach to schools and communities over a sustained period of time. Diversity Award. College of Education, University of Oregon (2010). Awarded to Lauren Lindstrom in recognition of outstanding service to the College and local community for advancing work in the area of diversity. Association for Maternal and Child Health Best Practice Award. (2010). Awarded to the Oregon Youth Transition Program (Lauren Lindstrom, Project Director) In recognition of a best practice model that has been extensively evaluated and proven effective in improving transition outcomes for youth with disabilities. Excellence in Technical Assistance for Transition Services Award. (2009). Awarded to the Youth Transition Program Technical Assistance Team (Lauren Lindstrom, Project Director) by the Oregon Association for Vocational Special Needs Personnel, a statewide network of education and rehabilitation professionals serving youth with disabilities. In recognition of exemplary work and excellent technical support to high school transition programs in Oregon. My scholarship is focused broadly on the areas of career development and improving post school employment outcomes for youth with disabilities. My publications include peer reviewed journal articles, books and book chapters and curriculum and training materials for education and rehabilitation professionals. *Graduate Student (or former graduate student) co-authors are italicized. Lindstrom, L., Hirano, K., Ingram, A., DeGarmo, D. & Post, C. (2018). “Learning to be myself”: Paths 2 the Future curriculum for young women with disabilities. Journal of Career Development. 1- 15. Hirano, K., Shanley, L., Garbacz, A., Rowe, D., Lindstrom, L. & Leve., L. (2018). Validating a model of motivational factors impacting involvement for parents of transition-age youth with disabilities. Remedial and Special Education, 39(1), 15-26. Poppen, M., Lindstrom, L., Khurana, A., Unruh, D. & Bullis, M. (2017). Preparing youth with disabilities for employment: An analysis of Vocational Rehabilitation case services data. Journal of Vocational Rehabilitation, 46, 209-224. Harwick, R., Lindstrom, L. & Unruh, D. (2017). In their own words: Overcoming barriers during the transition to adulthood for youth with disabilities who experienced foster care. Children and Youth Services Review. 73, 338-346. Poppen, M., Sinclair, J., Hirano, K., Lindstrom, L. & Unruh, D. (2016). Perceptions of mental health concerns for secondary students with disabilities during the transition to adulthood. Education and Treatment of Children, 39 (2) 221- 246. Young, J., Morgan, R., Callow- Heusser, C. & Lindstrom, L. (2016). The effects of parent training on knowledge of transition services for students with disabilities. Career Development and Transition for Exceptional Individuals. 39(2) 79-87. Alverson, C., Lindstrom, L., & Hirano, K. (2015). High school to college: Transition experiences of young adults with autism. Focus on Autism and Other Developmental Disabilities. 1 – 13. Moxley-South, K., Squires, J., Lindstrom, L. & Kerewsky, S. (2015). The Environmental Screening Questionnaire: A brief family risk and resilience screening. Human Services Education, 35 (1) 62 – 72. Kahn, L. & Lindstrom, L. (2015). I just want to be myself:” Identity and school experiences of adolescents with disabilities who identify as a sexual or gender minority. The Educational Forum. 79, 1- 15. Special Issue on Sexuality, Gender, Identity and Education. Lantrip, K., Luginbuhl, P., Chronister, K., & Lindstrom, L. (2015). Broken dreams: Impact of domestic violence on women’s career development over time. Journal of Family Violence, 30 (5) 591-605. Kahn, L., Lindstrom, L. & Murray, C. (2014). Factors contributing to preservice teacher’s beliefs about diversity. Teacher Education Quarterly,. 41(4), 53. Sheftel, A., Lindstrom, L. & McWhirter, B. (2014). Motivational enhancement career intervention for youth with disabilities. Advances in School Mental Health Promotion 7(4), 208-224. Lindstrom, L. (2014). Introduction to the Special Issue on Disability and Poverty. Career Development and Transition for Exceptional Individuals, 37, (1) 4. Lindstrom, L., Hirano, K., McCarthy, C., & Alverson, C. (2014). Just having a job: Case studies of low wage workers with intellectual and developmental disabilities. Career Development and Transition for Exceptional Individuals. Special Issue on Disability and Poverty. Volume 37 (1) 40 – 49. Barrett-Rivera, B., Lindstrom, L., & Kerewsky, S. (2013). Parenting in poverty: Experiences of fathers who are homeless. Human Services Education. 33(1), 75-86. Doren, B., Lombardi, A., Clark, J. & Lindstrom, L. (2013). Addressing career barriers for high risk adolescent girls: The PATHS curriculum intervention. Journal of Adolescence. 36, 1083-1092. Lindstrom, L., Kahn, L., & Lindsey, H. (2013). Navigating the early career years: Barriers and strategies for young adults with disabilities. Journal of Vocational Rehabilitation. 39, 1-12. Lombardi, A., Doren, B., Gau, J., & Lindstrom, L. (2013). The influence of instructional setting in reading and math on postsecondary participation. Journal of Disability and Policy Studies. 24 (3) 169 – 179. Doren, B., Gau, J., & Lindstrom, L. (2012). The relationship between parent expectations and post-school outcomes of adolescents with disabilities. Exceptional Children. 79(1), 7–23. Lindstrom, L., Harwick, R., Poppen, M. & Doren, B. (2012). Gender gaps: Career development for young women with disabilities. Career Development for Exceptional Individuals. 35(2), 108-117. Moxley, K., Squires, J., & Lindstrom, L. (2012). Early intervention and maltreated children: A current look at CAPTA and Part C. Journal of Infants and Young Children. 25(1), 3-19. Lindstrom, L., Doren, B., & Miesch, J. (2011). Waging a living: Career development and long term employment outcomes for young adults with disabilities. Exceptional Children. 77(4) 423-434. Doren, B., Gau, J., & Lindstrom, L (2011). The role of gender in the long-term employment outcomes of young adults with disabilities. Journal of Vocational Rehabilitation. 34 35-42. DOI:10.3233/JVR-2010-0532. Povenmire -Kirk, T., Lindstrom, L., & Bullis, M. (2010). De escuela a la vida adulta/From school to adult life: Transition needs for Latino youth with disabilities and their families. Career Development for Exceptional Individuals. 33(1) 41-51. Lindstrom, L., Downey-McCartney, R., Kerewsky, S., & Flannery, B. (2009). Supporting students with disabilities in post-secondary education. Human Services Education. 29 (1), 4 – 14. Lindstrom, L., Flannery, B., Benz, M., Olszewksi, B., & Slovic, R. (2009). Building employment training partnerships between vocational rehabilitation and community colleges. Rehabilitation Counseling Bulletin. 52(3). 189-201. Lichtenstein, D., Lindstrom, L., & Povenmire-Kirk, T. (2008). Promoting multicultural competence: Diversity training for transition professionals. Journal for Vocational Special Needs Education, 30(3), 3 – 15. Lindstrom, L. Johnson, P., Doren B., Zane, C., Post C., & Harley, E. (2008). Career Connections: Building opportunities for young women with disabilities. Teaching Exceptional Children. 40 (4), 66-71. Trainor, A., Lindstrom, L., Simon-Burroughs, M., Sorrells, A., & Martin, J. (2008). From marginalized to maximized opportunities for diverse youth with disabilities: Position paper of the Division on Career Development and Transition. Career Development for Exceptional Individuals. 31(1), 56-64. Lindstrom, L., Paskey, J., Dickinson, J., Doren B., Zane, C., & Johnson, P. (2007). Voices from the field: Recommended transition strategies for students and school staff. Journal for Vocational Special Needs Education. 29(2), 4-15. Doren, B., Lindstrom, L., Zane, C., & Johnson, P. (2007). The role of program and alterable personal factors in post school employment outcomes. Career Development for Exceptional Individuals. 30(3), 171 -183. Lindstrom, L., Doren, B., Metheny, J., Johnson, P., & Zane, C. (2007). Transition to employment: Role of the family in career development. Exceptional Children. 73(3), 348-366. Olsezewski, B., Macey, D., & Lindstrom, L. (2007). The practical work of coding: An ethnomethodological inquiry. Human Studies 29:363-380. Lichtenstein, D., Lindstrom, L., & Kerewsky, S. (2005). A delicate balance: An integrated model for preparation of ethically competent human services professionals. Human Services Education, 25(1), 27-40. Lindstrom, L., Benz, M., & Doren, B. (2004). Expanding career options for young women with learning disabilities. Career Development for Exceptional Individuals, 27(1). 43-63. Benz, M., Lindstrom, L., Unruh, D., & Waintrup, M. (2004). Sustaining secondary transition programs in local schools. Remedial and Special Education, 25(1), 39 – 50. Lindstrom, L., & Benz, M. (2002). Phases of career development: Case studies of young women with learning disabilities. Exceptional Children, 69 (1), 67-83. Benz, M., Lindstrom, L., & Yovanoff, P. (2000). Improving graduation and employment outcomes of students with disabilities: Predictive factors and student perspectives. Exceptional Children, 66 (4), 509-529. Benz, M., Lindstrom, L. & Latta, T. (1999). Improving collaboration between schools and vocational rehabilitation: The Youth Transition Program model. Journal of Vocational Rehabilitation, 13, 55-63. Lindstrom L., Benz, M., & Johnson M. (1997). From school grounds to coffee grounds: An introduction to school-based businesses. Teaching Exceptional Children, 29 (4), 18-22. Lindstrom L., Benz, M., & Johnson M. (1996) . Developing job clubs for students in transition. Teaching Exceptional Children, 28 (2), 16-23. Benz, M., Johnson, D., Mikkelsen, K., & Lindstrom, L. (1995). Improving collaboration between schools and vocational rehabilitation: Stakeholder identified barriers and strategies. Career Development for Exceptional Individuals, 18, 133-144. Benz, M., Lindstrom, L., & Halpern, A. (1994). Mobilizing local communities to improve transition services. Career Development for Exceptional Individuals 18, 21-32. Halpern, A., Benz, M., & Lindstrom, L. (1991). A systems change approach to improving secondary special education and transition programs at the local community level. Career Development for Exceptional Individuals, 15 109-119. Lindstrom, L. (2014). Special Issue on Disability and Poverty. Career Development and Transition for Exceptional Individuals. Hidalgo, N., McIntyre, L.L., McWhirter, E., & Lindstrom, L. (under review). From frustration to empowerment: A qualitative exploration of experiences of mothers of children with ASD. Focus on Autism and Developmental Disabilities. Ingram, A., Kofke, M. & Lindstrom L. (in preparation) Girls only: Agentic assemblage in posthuman feminism. Gender and Education. Kahn, L., Lindstrom, L., & Sinclair, J. (in preparation). Rainbow picket fence: Career aspirations for adolescents with disabilities who identify as a sexual or gender minority. Career Development and Transition for Exceptional Individuals. Lindstrom, L., Lind, J. & Gee, K. (in press). Transition to employment. In S. Hupp & J. Jewell (Eds.) The Encyclopedia of Child and Adolescent Development. Wiley Blackwell, Hoboken, New Jersey. (Invited peer reviewed entry). Lindstrom, L., Hirano, K. & Ingram, A. (under review). Finding our voices: Employment for women with disabilities. In G. Wright & S. L. Fielden &. (Eds.) Disability and Work. Basingstoke, United Kingdom: Palgrave MacMillan. (Invited peer reviewed chapter). Lindstrom, L., Hirano, K. & Thomas, R. (2018). Career development for individuals with disabilities: Examining issues of equity, access and opportunity. In A. Broadbridge & S. L. Fielden (Eds.) Impact of Diversity on Career Development. Cheltenham, UK and Northampton MA: USA Edward Elgar Publishing. (Invited peer reviewed chapter). Lindstrom, L., & Kahn, L. (2014). Career advancement for young adults with disabilities. In J. Heymann, M.A. Stein & G. Moreno (Eds.) Disability and Equity at Work. New York: Oxford University Press. (Invited peer reviewed chapter). Lindstrom, L., Doren, B., Flannery, B., & Benz, M. (2012). Structured work experiences. In M. L. Wehmeyer & K. Webb (Eds.) Handbook of adolescent transition education for youth with disabilities. New York: Routledge. (Invited peer reviewed chapter). Flannery, B., Lindstrom, L., & Torcellis, M. (2009). High school and community college partnerships with vocational rehabilitation. In D.K Unruh & H.B Clark (Eds.) Transition of young people with emotional or behavioral difficulties: An evidence based handbook. Brookes Publishing. Baltimore, MD. (Invited peer reviewed chapter). Benz, M., & Lindstrom L. (1997). Building school-to-work programs: Strategies for youth with special needs. Pro-ED, Austin: TX. I have made more than 150 presentations at professional conferences on a variety of topics related to career development, transition, post school employment outcomes, gender equity and family and human services. I have listed selected presentations since 2005. Lindstrom, L. & Post, C. (2016). Moving from the Margins to the Center: Expanding Career and Education Opportunities for High School Girls with Disabilities. 32nd Annual Pacific Rim International Conference on Diversity and Disability; Honolulu, Hawaii. Lindstrom, L. (2015). Secondary Special Education and Transition: Best Practice Strategies. Invited presentation to Special Education Team, Department of Education, State of Yap, Federated States of Micronesia. Lindstrom, L. (2014). Best Practices in Special Education for Secondary Students. Presentation to delegation from Ministry of Education, Saudi Arabia. Lindstrom, L. (2014). Planning Transitions for Secondary Students with Disabilities. Presentation to delegation from Ministry of Education, Saudi Arabia. Lindstrom, L. (2013). Oregon Youth Transition Program: Innovative Practice. International Conference on Employment Rights: Innovative Policies and Practices for Persons with Disabilities. Vienna, Austria. (Invited presentation). Lindstrom, L. (2012). Getting a Job, But Not Just any Job: Towards Competitive, Meaningful Work. Disability and Work: Global Strategies for Equity. Institute for Health and Social Policy Conference. Montreal, Canada. (Invited presentation). Lindstrom, L., & Post, C. (2012). Building Career PATHS for Girls with Disabilities. 28th Annual Pacific Rim International Conference on Diversity and Disability; Honolulu Hawaii. Lindstrom, L. (2011). Preparing for Life Beyond School: Transition Assessment Planning and Curriculum. Multidisciplinary Conference on Special Education. Kingston, Jamaica. Sponsored by the Jamaican Ministry of Education. (Invited workshop session). Lindstrom, L. (2011). Building School and Community Partnerships: Strategies and Considerations. Multidisciplinary Conference on Special Education. Kingston, Jamaica. Sponsored by the Jamaican Ministry of Education. (Invited workshop session). Lindstrom, L. (2011). Family Involvement in Transition. Multidisciplinary Conference on Special Education. Kingston, Jamaica. Sponsored by the Jamaican Ministry of Education. (Invited session). Lindstrom, L. (2011). Transition Collaboration. Impact: The Oregon Youth Transition Program Model. Utah Conference on Effective Practices for Teachers and Human Services Professionals. Logan, Utah. (Invited special session). Lindstrom, L. (2011). Transition to College: What Works for Students With Disabilities. Utah Conference on Effective Practices for Teachers and Human Services Professionals. Logan, Utah. (Invited special session). Lindstrom, L. (2010). A Gardener’s Guide to Improving Transition Services and Outcomes: Tools for 2010. Utah Conference on Effective Practices for Teachers and Human Services Professionals. Logan, Utah. (Keynote address). Lindstrom, L. (2010). Growing Up and Moving On: Family Involvement in Career Development. Utah Conference on Effective Practices for Teachers and Human Services Professionals. Logan, Utah. (Invited special session). Lindstrom, L. (2010). Career Planning for Young Women with Disabilities. Utah Conference on Effective Practices for Teachers and Human Services Professionals. Logan, Utah. (Invited special session). Hirano, K. & Lindstrom, L. (2018). Parent Involvement in Transition Planning for Youth with Disabilities: A Qualitative Meta-synthesis. American Educational Research Association Conference, Family, School and Community Partnerships SIG, New York, NY. Ingram, A., Kofke, M. & Lindstrom, L. (2018). “Girls Only”: Agentic Assemblage in Posthuman Feminism. American Educational Research Association Conference, Disability Studies SIG, New York, NY. Hirano, K., DeGarmo, D., Khurana, A., Leve, L. & Lindstrom, L. (2018). Paths 2 the Future: Testing the efficacy of a career development intervention for young women with disabilities. Institute for Education Sciences, Principal Investigators Meeting. Washington, D.C. (poster session). Lindstrom, L. & Hirano, K. (2017). “Learning to be Myself”: Paths 2 the Future Career Development Curriculum for Young Women with Disabilities. C.E.C. Division on Career Development and Transition, 20th International Conference; Milwaukie, WI. Hirano, K., & Lindstrom, L. (2017). Paths 2 the Future: Addressing barriers to education and career opportunities for girls with disabilities. presented at a roundtable session titled “Research on the Identity of Women and Girls in Education” sponsored by the Special Interest Group on Women and Education. American Educational Research Association Conference, San Antonio, Texas. Khurana, A., Hirano, K. & Lindstrom, L. (2017). The Role of Self-regulation in Promoting Autonomy and Positive Vocational Outcomes for High-school Girls with Disabilities. Society for Research on Child Development (SRCD) Biennal Meeting. Austin, Texas. (poster session). Khrana, A., Leve, L. & Lindstrom, L. (2016). “Paths 2 the Future”: Self-regulation, Autonomy, and Career Development for High School Girls with Disabilities. Institute for Education Sciences, Principal Investigators Meeting. Washington, D.C. (poster session). Lindstrom, L. & Post, C. (2015). Expanding Career Options and Opportunities for Young Women with Disabilities. C.E.C. Division on Career Development and Transition, 18th International Conference; Portland, Oregon. Poppen, M. & Lindstrom, L. (2015). Understanding Employment Outcomes for Young Adults with Disabilities C.E.C. Division on Career Development and Transition, 18th International Conference; Portland, Oregon. Lindstrom, L., (Symposium Chair), Karpur, A., Brewer, D., Wagner, M., Newman, L. Rabren, K. & Carpenter C. (2015). Disability, Poverty and Post-School Outcomes: Exploring School and Family Influences. Symposium sponsored by the Special Education SIG. American Educational Research Association Conference, Chicago, Illinois. Kahn, L., & Lindstrom, L. (2015). Why Can’t We Just Be Who We Are? Identity and Beliefs of LGBTQI Adolescents with Disabilities? Panel discussion sponsored by the Disability Studies SIG. American Educational Research Association Conference, Chicago, Illinois. Kerewsky, S., & Lindstrom, L. (2014). Planning Successful Educational Travel: Tetanus, Revolution, and “My Daughter Is Where? !” National Organization for Human Services, Las Vegas, NV. Moxley, K., & Lindstrom, L. (2014). Family and Human Services Early Childhood Emphasis. National Organization for Human Services, Las Vegas, NV. Lindstrom, L. & Post C. (2014). Building Career PATHS for High School Girls with Disabilities. National Association for Workforce Improvement 49th Annual Conference; Portland, Oregon. Lindstrom, L., & Kahn, L. (2013). Navigating the Early Career Years: Barriers and Strategies for Young Adults with Disabilities. C.E.C. Division on Career Development and Transition, 17th International Conference; Williamsburg, VA.
Alverson, C., Lindstrom, L. & Hirano, K. (2013). Transition to College: Needs of Young Adults with Asperger Syndrome C.E.C. Division on Career Development and Transition, 17th International Conference; Williamsburg, VA.
Lindstrom, L. (2013) PATHS: Improving Career and Educational Outcomes for Young Women with Disabilities, presented at a roundtable session titled “Intersections – Gender and Race/Class/Ability” sponsored by the Special Interest Group on Women and Education. American Educational Research Association Conference, San Francisco, California. Downey-McCarthey, R., & Lindstrom, L. (2013). Postsecondary Educational Transitions for At-Risk Youth: Results of the College Transition Support Program, presented at a roundtable session titled “Navigating the Community College-University Transfer Process”. American Educational Research Association Conference, San Francisco, California. Kerewsky, S., & Lindstrom, L. (2012). Students in Jeopardy. Facilitating Student Success in Human Services Programs. National Organization of Human Services, Milwaukie, Wisconsin. Lombardi, A., Doren, B. & Lindstrom, L. (2012). Pilot Study of a Curriculum to Improve Education and Career Outcomes for Girls with Disabilities. (poster session) Society for Research on Educational Effectiveness. Washington DC. Lindstrom, L., Post, C., Doren, B, & Lombardi, A. (2011). Building Career PATHS for Girls with Disabilities. C.E.C. Division on Career Development and Transition, 16th International Conference; Kansas City, Missouri. Povenmire -Kirk, T., & Lindstrom, L. (2010). Building Resilience in Diverse Youth: Collaborative Strategies. National Organization of Human Services Conference, Portland, Maine. Doren, B., & Lindstrom, L. (2010). PATHS Project: Post School Achievement Through Higher Skills. Institute for Educational Sciences, Project Director’s Meeting, Washington, D.C. (poster session). Lindstrom, L. (2018). Improving Transition Outcomes for Youth with Disabilities: Paths 2 the Future Curriculum. University of California SPEDDR (Special Education, Disabilities, and Developmental Risk) Conference. Davis, California. Lindstrom, L. & Post, C. (2017). Paths 2 the Future Curriculum Overview and Outcomes. Teacher Training workshop. Eugene, Oregon. Post, C., Lindstrom, L. & Ingram, A. (2017). Expanding Career and Educational Opportunities for Girls with Disabilities. Topical Strand: Educational Practices for Transition Aged Youth. Oregon Statewide Transition Conference. Portland, Oregon. Lindstrom, L. & Post, C. (2016). What about the girls? : Career Options for High School Girls with Disabilities. Oregon Association for Vocational Special Needs Personnel Conference. Hood River, Oregon. Lindstrom, L. Hirano, K. & Alverson, C. (2015). “Just Having a Job” : Employment Strategies for Young Adults with Intellectual and Developmental Disabilities. Oregon Association for Vocational Special Needs Conference. Hood River, Oregon. Lindstrom, L., & Kahn, L. (2014). Navigating the Early Career Years: Barriers and Strategies for Young Adults with Disabilities. Oregon Youth Transition Program Statewide Conference. Hood River, Oregon. Lindstrom, L., Post, C. & Kahn, L. (2014). PATHS to the Future: Career Options for Young Women with Disabilities. Oregon Association for Vocational Special Needs Conference. Hood River, Oregon. Alverson, C., Lindstrom, L. & Hirano, K. (2013). Transition to College: Needs of Young Adults with Asperger Syndrome. MEGA Conference on Disability. Salem, Oregon. Lindstrom, L., Dickinson, J., & Hirano, K. (2012). Poverty: Causes, Consequences, and Strategies for Youth in Transition. Oregon Youth Transition Program Summer Academy. Silver Falls, Oregon. Lindstrom, L. & Post, C., (2012). Building Career PATHS for Girls with Disabilities. Oregon Association for Vocational Special Needs Personnel Conference; Hood River, Oregon. Lindstrom, L. & Harwick, R. (2012). Transition for Youth with Traumatic Brain Injuries. Oregon Youth Transition Program Conference; Hood River, Oregon. Lindstrom, L. (2011). Improving Transition Outcomes for Youth with Autism, Emotional/Behavioral Disabilities and TBI. Youth Transition Program Summer Academy; Silverton, Oregon. Lindstrom, L., Poppen, M. & Hillman, K. (2011). The Oregon Youth Transition Program: Celebrating 20 Years. Oregon Association for Vocational Special Needs Personnel Conference; Hood River, Oregon. Lindstrom, L., Post, C. & Lombardi, A. (2011). PATHS Project: Increasing Career Options for Girls. Oregon Association for Vocational Special Needs Personnel Conference; Hood River, Oregon. Lindstrom, L., Rees, C., Burr, J., FitzGerald, P., Johnson, M., & Dickinson, J. (2010). YTP A Collaborative Service Delivery Model: Celebrating 20 Years. Oregon Vocational Rehabilitation Statewide In-Service Conference. Salem, Oregon. Lindstrom, L. (2010) Youth Transition Program Statewide Overview. Youth Transition Program Summer Academy; Silverton, Oregon. Lindstrom, L., Poppen, M., & Post, C. (2010). Resilience: Building Capable Young People. Oregon Association for Vocational Special Needs Personnel Conference; Youth Transition Program Statewide Conference; Hood River, Oregon. Since 1996, I have served as Principal Investigator, Co-Principal Investigator or Project Director for 16 federal grants and state contracts directly related to my training, research, and outreach activities totaling over 19 million dollars. In addition, the state and local service delivery partnerships that have been part of my scholarship activities have had a significant impact on local communities. The Oregon Youth Transition Program (YTP), for instance, is an ongoing partnership between Oregon Vocational Rehabilitation, Oregon Department of Education, University of Oregon, and local school districts statewide. The YTP has been implemented in 90% of Oregon high schools and served over 27,000 youth with disabilities. My primary interest in this area has been to create materials for professionals that link research to practice. I have created curricula to use in local high schools, teacher training materials, and resource information for education and rehabilitation personnel. Lindstrom, L., Doren, B., Post, C, Kahn, L., Lombardi, A. & Poppen, M. (2011). PATHS (Post School Achievement Through Higher Skills) Teacher Resource Guide. Secondary Special Education and Transition Research Unit, University of Oregon. Benz, M., Lindstrom, L., & Johnson, M. (1993). Youth Transition Program: Procedures Manual. Eugene, OR: University of Oregon Press. Lindstrom, L., & Benz, M. (1991). Community Transition Team Model: Management Information System Manual. Eugene, OR: University of Oregon Press. Benz, M., Lindstrom, L., & Halpern, A. (1990). Community Transition Team Model: Facilitator’s Manual. Eugene, OR: University of Oregon Press. Since 2000, I have developed courses and taught primarily in the Family and Human Services (FHS) undergraduate program in the Department of Counseling Psychology and Human Services, College of Education at the University of Oregon. I have also taught professional seminars for the Special Education doctoral program and provided supervised research and teaching opportunities for Counseling Psychology and Special Education doctoral students. I have served as member and chair/co-chair of doctoral dissertation committees in Counseling Psychology (CPSY), Educational Methodology, Policy and Leadership (EMPL) and Special Education (SPED). Although my primary role has been with undergraduates, I have served on 31 dissertation committees, serving as chair or co-chair for 6 students. I have also supervised and provided mentoring for two post-doctoral research scholars. As the Dean at UC Davis, I do not teach any formal courses but have stayed active in teaching through guest lecturing and dissertation committee service. Dissertation committee outside member, Ms. Marisa Kofke (SPED, University of Delaware). A phenomenological study of autistic female adolescents’ perspectives on school-based social skills experiences. In Process. Proposal approved February 2017. Dissertation committee member, Ms. Angela Ingram (SPED, University of Oregon). A phenomenological study of transgender youth with disabilities high school experiences. July 2018. Dissertation committee member, Mr. Geoffrey Barrett. (EMPL). Educating the homeless: An examination of educational supports for homeless adolescents. In Process. Proposal approved March 2015. Dissertation Chair, Ms. Kara Hirano (SPED). Development of a tool to predict parent involvement in secondary special education and transition planning. May 2015. *Kara Hirano was the first runner up for the 2016 Pat Sitlington Emerging Researcher Award from the CEC Division on Career Development and Transition for this dissertation research. Dissertation committee member, Ms. Nina Hidalgo. (CPSY). A phenomenological exploration of family experiences obtaining a diagnosis and accessing services for their children with ASD. May 2015. Dissertation committee member, Mr. Don Hood. (EMPL). Effects of the middle school transition on reading and math achievement of students with autism spectrum disorder, traumatic brain injury, or emotional behavioral disturbance. March 2015. Dissertation Chair, Mr. Marcus Poppen (SPED). Vocational Rehabilitation: Predicting employment outcomes for young adults with disabilities. November 2014. *Marcus Poppen received the 2015 Pat Sitlington Emerging Researcher Award from the CEC Division on Career Development and Transition for this dissertation research. Dissertation committee member, Ms. Robin Harwick. (SPED). Transition experiences for youth with disabilities in foster care. August 2014. Dissertation Chair, Ms. Laurie Kahn. (SPED). Experiences, sense of self, and beliefs about the future for lesbian, gay, bisexual, transgender, questioning, queer, and intersex adolescents with disabilities. May 2014. *Laurie Kahn received the 2015 Outstanding Dissertation Award from the Disability Studies in Education Special Interest Group of the American Education Research Association for this dissertation research. Dissertation Co-Chair, Ms. Anya Sheftel. (CPSY). Motivational enhancement career intervention for youth with disabilities. October 2013. Dissertation committee member, Ms. Leah Barr. (CPSY). Examination of intimate partner conflict over time. September 2013. Dissertation committee member, Ms. Paula Luginbuhl. (CPSY). Addressing the aspiration-expectation gap among Latino and low-income high school students: A test of sociopolitical development theory and self-determination theory. May 2013. Dissertation committee member, Ms. Leslie Graves. (CPSY). An investigation of the effects of school context, school connectedness, and academic self-efficacy, on multidimensional outcomes among Chilean adolescents. March 2013. Dissertation committee member, Mr. Christopher Vatland. (SPED). The effects of structured team meetings and performance feedback on person-centered planning activities. August 2012. Dissertation committee member, Ms. Kathy Moxley. (SPED). The environmental screening questionnaire: Validity and utility study. August 2012. Dissertation committee member, Ms. Erika Hinds. (CPSY). An investigation of middle school teacher stress, psychological flexibility, and measures of mental health using the acceptance and action questionnaire for teachers. June 2012. Dissertation Co-Chair, Ms. Rosemarie Downey-McCarthy. (CPSY). Postsecondary educational transition for at risk-youth: Exploration of the College Transition Support Program. June 2012. Dissertation committee member, Ms. Jennifer Miesch, (CPSY) An investigation of background and contextual variables related to career decision self-efficacy and vocational outcome expectations for college women with learning disabilities. April 2011. Dissertation Co-Chair, Ms. Eliza Harley, (CPSY) The impact of interpersonal relationships on employment outcomes and community integration for young women with learning disabilities. May 2010. Dissertation committee member, Ms. Corrina Falkenstein, (CPSY) Parent-child relationships as predictors of change in the growth of teacher and school connections during early adolescence. June 2009. Dissertation committee member, Ms. Tiana Povenmiere-Kirk, (SPED) Transition needs for Latino youth with disabilities. May 2009. Dissertation committee member, Ms. Lissa Geiken, (CPSY) Investigation of cognitive predictors for exploration and career difficulties. May 2009. Dissertation committee member, Ms. Susana Salgado, (CPSY) Influences of feminist orientation and family connectedness on adolescent latino/as student career aspirations. May 2007. Dissertation committee member, Mr. David Lichtenstein, (CPSY) Expanding models for implementation research: Examining the implementation of the adolescent transitions program. June 2006. Dissertation committee member, Ms. Carolyn Swearingen, (CPSY) An examination of the relationship among disordered eating and minority stress variables associated with sexual orientation. May 2006. Dissertation committee member, Ms. Michelle Meredith, (SPED) Transition and beyond: A multi case study on employment stability as a post school outcome for young men with disabilities. March 2005. Dissertation committee member, Ms. Jody Knott, (CPSY) Self-efficacy and motivation to change among chronic youth offenders: An exploratory examination of the efficacy of an experimental learning motivation enhancement intervention. February 2004. Dissertation committee member, Mr. Trent Atkins, (SPED) Alternative education programs: case studies of students with and without disabilities. May 2003. External Examiner/Outside committee member, Mr. J. Magumise (University of Pretoria), Parent and teacher experiences of Zimbabwean inclusive education. November 2017. Comprehensive exam committee member. Ms. Isabelle Rivera (Ph.D. in Architecture and Allied Arts, University of Oregon). Classroom indoor environmental quality, student health and learning outcomes. May 2017. Comprehensive exam committee member. Ms. Lyndsey Deaton.. (Ph.D. in Architecture and Allied Arts, University of Oregon). Interpreting the next generation’s urban experience. April 2017. External Examiner/Outside committee member, Mr. Jay Mpofu (University of Pretoria), The contribution of inclusive community strategies to the psychological well-being of adolescents with physical disabilities. January 2017. Honor’s college methodology adviser, Ms. Bailey Rathbun, (FHS) Saddle Sore: A pilot study of Rideable’s equine assisted intervention program. June 2015. McNair Scholar faculty research mentor. Ms. Brenda Barret-Rivera (FHS) Parenting in poverty: A qualitative study of homeless fathers. February 2013. Master’s project graduate advisor. Mr. Marcus Poppen (SPED) Identifying effective components of school-based mentoring programs. May 2012. Master’s project graduate advisor. Mr. Martin McDowell (SPED) What are the likely effects of poverty upon the transition outcomes of students with disabilities from secondary to post-secondary outcomes? September 2007. Master’s project graduate advisor. Ms. Jenny Paskey (SPED) Recommendations for transition strategies and services. August 2005. Master’s project graduate advisor. Ms. Claire Zane (SPED) The importance of self-determination skills for students with developmental disabilities: Implications for the transition process. May 2005. Honor’s college committee member, Ms. Kristin Huhtula, (FHS) Effects of a self-monitoring program on student engagement in an alternative school setting. May 2004. Master’s project graduate advisor. Ms. Kelly Herbert (SPED) Gender issues in transition programs. August 2002. Master’s project graduate advisor. Ms. Cindy Burger (SPED) Components essential to positive postschool outcomes for youth with emotional and behavior disorders. August 2001. Since 2000, I have been actively involved in service to the profession. I regularly participate in national and international service activities, including the Special Education Scientific Review Panel for the Institute of Educational Sciences. I have been a member or chair of numerous University, College, and Department committees and served in several senior leadership roles in the University of Oregon College of Education including Associate Dean of Research and Interim Department Head for Counseling Psychology and Human Services. 2017 Expert Review Panel: Zero Project 2017. Innovative Practices on Employment, Work and Vocational Education (Invited peer reviewer for international award). 2015 Expert Review Panel: Zero Project 2016. Innovative Practices on Inclusive Education. (Invited peer reviewer for international award). 2013 Expert Review Panel: Zero Project 2014. Innovative Practices on Accessibility. (Invited peer reviewer for international award).